As I step out of the car in the parking area I can see a corella wrestling with a large pine cone almost half its size. The persistent little parrot has rolled the cone onto the edge of the roadway where it can tear open the hard outer scales to get at the soft seeds inside. Every so often a car barrels past, ruffling the bird's feathers but the prize seems worth the risk. I am taking a leisurely stroll around the perimeter of Adelaide's two adjacent, metropolitan golf courses. Starting in the suburb of North Adelaide, they stretch down to the Torrens River alongside the Morphett Street Bridge. Over the years I have played golf in many places across the world and few, if any, have such attractive courses so close to a city centre. In addition, these well watered and carefully planted spaces attract a wide variety of bird life, an added bonus for both casual walker and golfer alike. There are other advantages when taking a nature walk through Adelaide's urban golf links; parking is easy, there are paths to follow and the restaurant is open whenever the course is. Not really the nature photography but a nice way to spend a few hours getting some exercise and fresh air. Leaving the clubrooms behind, I make my way to the third tee on the South course where the view down the fairway to the city is quite breathtaking. Tall pines and eucalypts border the grassy slope and families of noisy miners and cockatoos are feeding, preening and generally socialising in the upper branches. A few hundred metres from the third green there is a lovely little par 3 which provides a fine view of the Carclew Performing Arts Centre as you walk up the hill towards North Adelaide. Under the tall pines that sit behind this green I spot a crested pigeon searching for seeds and other titbits in the leaf litter. Though not as brightly coloured as the many parrots that inhabit the course its subtle pastel shading is equally beautiful. From the top of Montefiore Hill it is a comfortable walk down the pathway to the left of the course where both musk and rainbow lorikeets often feed in the tall eucalyptus trees which provide nectar and seeds for these noisy little parrots. The section of the course closest to the city runs along Memorial Drive which follows the lake to the weir. 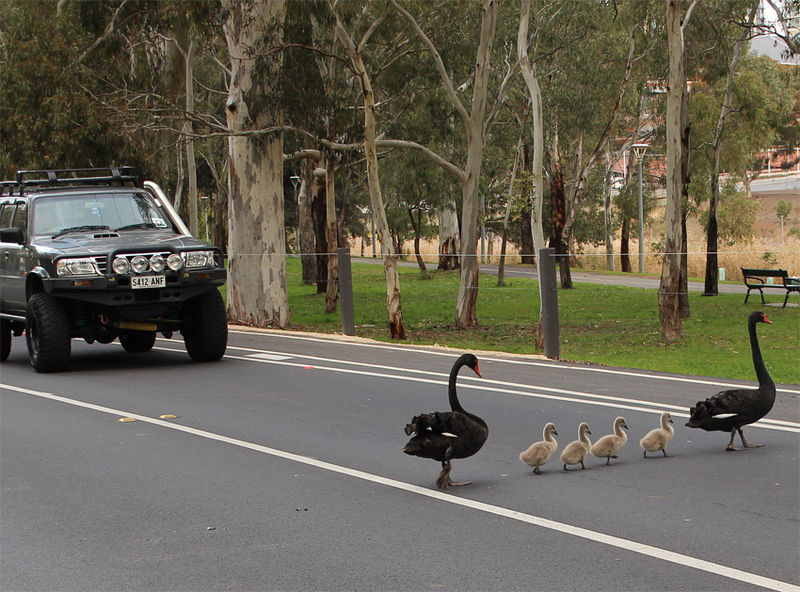 It is here that my most memorable encounter for the day occurs; a family of black swans nonchalantly holding up the traffic while they guide their young ones across the road. Like the swan family, I cross the road towards the lake but not to peck at grass or forage in the water for aquatic plants. A little par 3 golf course lies on this side of the road starting at the weir and running parallel to the main courses for half a kilometre or so. There is a small cafe, bike hire and a couple of nice restaurants here; the perfect place to enjoy a coffee before the short walk up through the course to Strangways Terrace where I started my circuit of the North Adelaide Golf Links. Excellent article and images and a wonderful walking area so close to the CBD.Must walk this area again,when the weather cools down.